A Teddy Bear has long been an enduring symbol of warmth and affection. A childhood keeper of secrets, who gives comfort and security, no matter what age you might be. 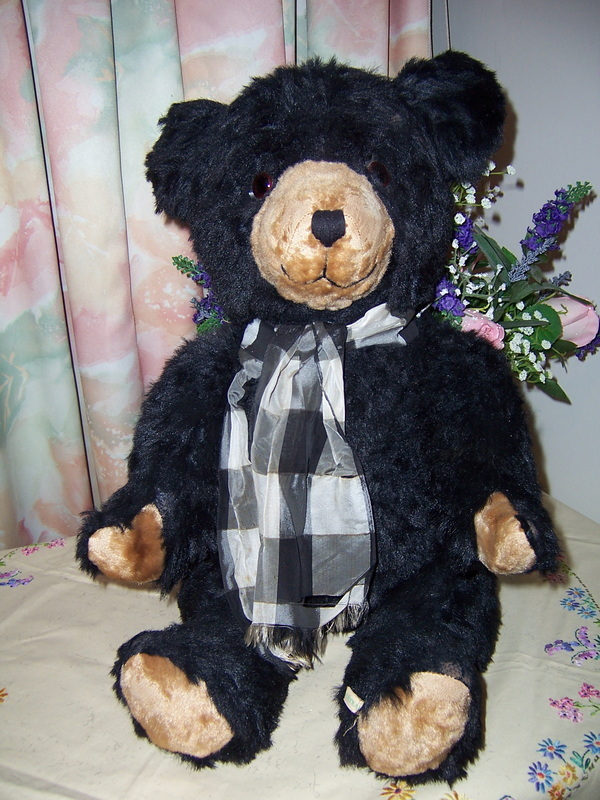 41cm (16") non-jointed stuffed with chopped nylon fibres brown bear. This bear was made by Ideal to commemorate the President Of USA Teddy Roosevelt who refused to shoot a bear cub on a hunting trip in1903. The founder of the Ideal Toy Corportaion in New York made a toy bear, which with the President's permission, he called Teddy's Bear. This bear is in original box. Covering cellophane has been removed. Box in good condition with a slight tear to front window. Bear does not appear to have been removed from box. Has vinyl sticker on fur saying the Original Ideal Teddy Bear. Brown glass eyes, stitched mouth and nose, painted paw prints on all four paws. Has been in someone's collection and appears like new. PLEASE EMAIL FOR MORE PHOTOS IF REQUIRED. 30cm (11 1/2"). No. 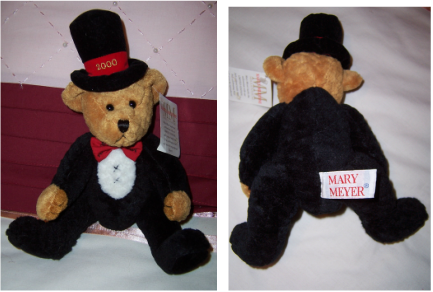 277 of limited edition of 600 bears. Machine washable plush fur, with brown glass eyes, stitched nose and mouth. Bandaged right arm and left leg, red ribbon bow tie. Comes with own "Birth Certificate" stating No. 277/600, which is rolled and tucked into sparkling ribbon belt. This large black bear has the green printed "Made In Australia" tag on one of his feet. We have been told that he is a rare Joy Toy teddy bear who is approx 50 years old and is still in great condition. He still has his working growler which is very rare. He has a wool blend black shaggy fur over his body, with pale brown original fur pads. His head is stationery, has jointed limbs which can be moved to different positions. He has brown plastic eyes with black vinyl backing, W shaped mouth, black floppy inset ears, light brown muzzle (same as pads) and black stitched nose. Around his neck is a vintage black and white large checked ribbon which is fraying at the edges. There are some sparse areas on his body but you really need to look hard to find them. There is also one ear which has come away from his head in one small spot, and on one leg joint an area which needs to be restitched. These things do not detract from him but told for accuracy and could be easily fixed. His black fur has a tendency to drop small filaments - nothing drastic but told for accuracy. This bear is so endearing and really a great collectors item. This gorgeous large golden mohair bear is an artist bear and has no tags on her anyway to state who actually made her. She is dressed like she is going to the Opera and so we have named her "Gabriella" and is "one of a kind".
. Black hand stitched nose and mouth.
. Stiff stand up ears. .She is fully jointed at the neck, and legs, and can be made to stand or sit. She is wearing a see through black embroidered lace dress with lace sleeves. On the front of the lace dress is an appliqued black and red beaded trim. The dress is done up with press studs at the back and can be removed if desired. She is also wearing a string of "pearls" around her neck and a black veil for her head. Gabriella is just gorgeous and would look so pretty sitting on a shelf or bed. Applause Inc.,Woodland Hill CA, Made in China, Contents- all new material fibres. black hand stitched nose and mouth. original hangtag to her ear and back. She is jointed at the neck, arms and legs, and can be made to stand or sit. She has on a very pretty blue tutu ballerina outfit with red satin ribbon on her head and feet. Toyland Ballerina is very endearing. 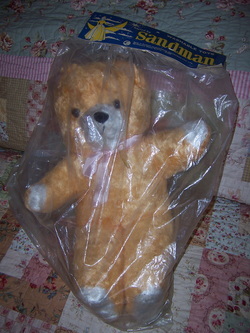 This gorgeous bear is 48cm tall, and is still in his original plastic unopened bag since new. He is approx 30 years old. This bear has a music box inside him which plays the unofficial Australian National Anthem of "Waltzing Matilda". Sandman Pty Ltd in Sydney. We believe this bear to be circa 1960/1970. He is a plush yellow bear with brown glass eyes, stitched black nose, stitched mouth, a white muzzle,and white paw pads. He has a pink ribbon around his neck and a gold metal circle in his back which turns the music box inside him. He is soft to touch through the plastic wrapper. The plastic bag does not appear to have any rips/tears in it but it has come away a little from the top of the paper tag. 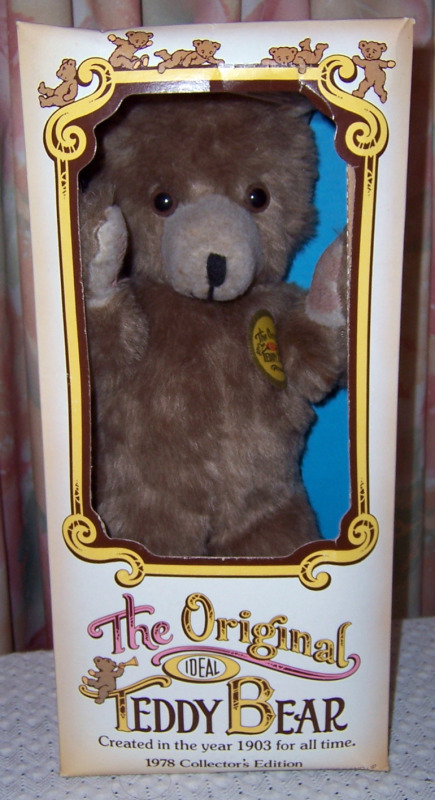 This bear is highly collectable and extremely rare to find in such immaculate condition with the music box still working after at least 30 years. 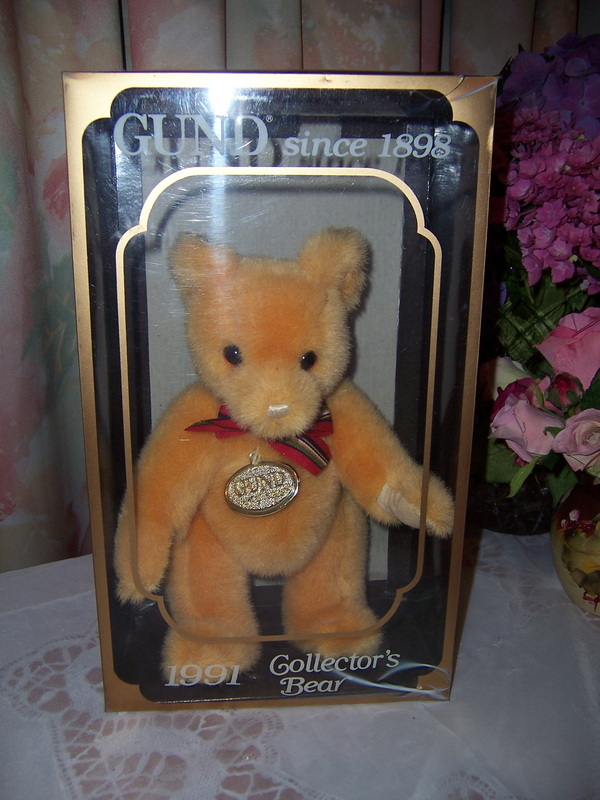 For almost 100 years Gund has made stuffed toys of matchless charm and quality. They choose plush of unusual softness, colour and original design. They give each creature an appealing personality and fill it with love. He is a very cute soft teddy bear, which is dark brown in colour and has a green hat on his head with his ears poking out. He has black glass eyes,stitched nose and cream fur type fabric pads. 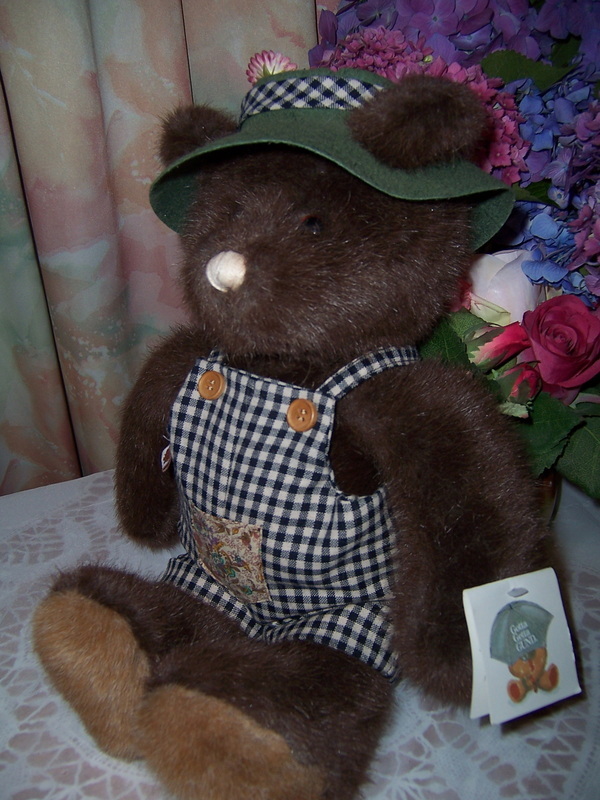 He is wearing his original little black and cream gingham type overalls which has the Gund tag on the bib. He appears almost like new and has his paper tag still attached to his arm. This is a very cute little soft teddy bear, which is yellow in colour and has a striped red tie around his neck. He looks brand new and we feel he has been in someones collection and just displayed in the box. He has brown glass eyes,stitched nose and cream velour type fabric pads. He is jointed at his neck, arms and legs and can be put into different positions. He has his tag on his arm and another tag on the back of his body. He comes in his original box which has a few marks on it (see photos) and we think the original lining inside the box is perhaps missing. This cute supersoft Gund teddy bear is a ''Welcome Little One Cute as a Button'' teddy bear and baby bear. 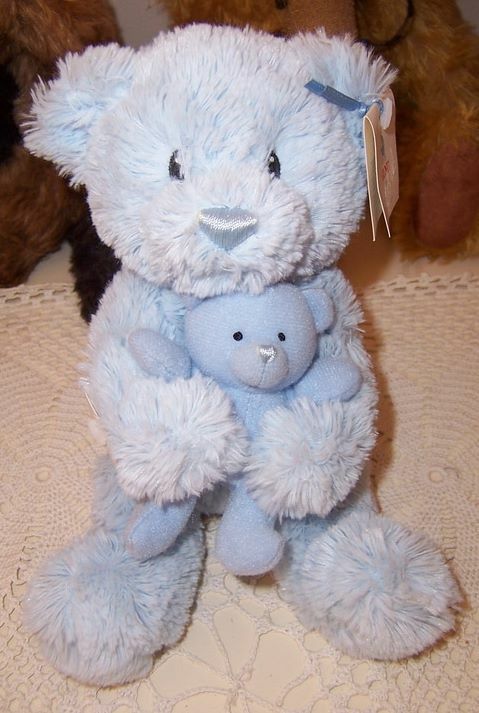 The large bear is a shaggy supersoft blue fur, and is holding a tiny blue bear which is made of a different blue fur fabric. The arm of the larger bear has a music box inside it, and when you press it, it will play a lullaby ''Twinkle Twinkle Little Star''. This is a perfect gift for a newborn baby boy. The original tag on the ear shows a little wear. He is in wonderful unplayed with condition, and appears almost like new. VINTAGE NORTH AMERICAN BEAR CO.
Nearly 30 years ago, North American Bear Company began as a creative business enterprise of a newmother, Barbara Isenger, starting a family in New York City (USA) in the mid 1970's. Her desire was to find a teddy bear with the nostalgic charm of an antique toy and a comtemporary sense of whimsy for her small son which prompted the start of the company who created unique high quality plush bear that would appeal to both children and adults alike. Her bears came in many bright colours, and were dressed as many different famous people with bear names - Scarlet O'Beara, Chef Bernaise, Douglas Bearbanks, Lauren Bearcall Bacall, Beralyn Monroe, and Ludwig von Bearthoven Beethoven and Libearace. Our bear is blue in colour and he is called LIBERACE after the famous American pianist and entertainer. His tag at the back on his body states c1979 but his original paper tag around his neck has 1985 on it. He is a real dapper of a bear and dressed in very glitzy clothes as you would expect the real Liberace to wear. He has his original outfit, front removable satin bib with blue bowtie and ruffles, long pants and dinner jacket with tails. One of his paws has a little aged wear to it - see photos but nothing bad and again you have to look hard to see it. 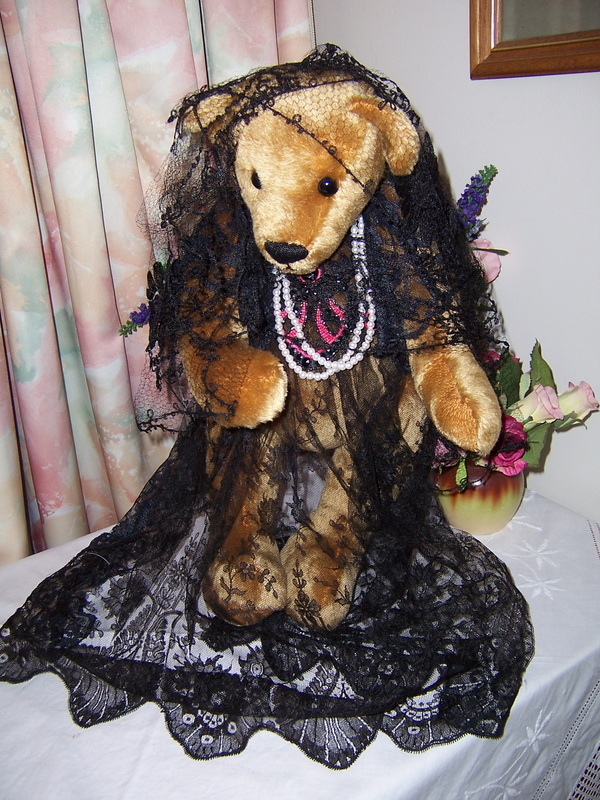 He is a wonderful bear who is dressed for a special recital evening. Marcus Milestone was produced in 1999 for the special millenium year of 2000. He is all dressed up for his big New Years Eve party in his top hat, bow time and tuxedo type outfit.
. white material tag to body stating name etc. Flopsy Graduate is a soft and cuddly Teddy & Friends teddy bear. She is all dressed up ready for her Graduation Day. She would be a lovely gift for that special person who is about to Graduate from school.